Watermere at Southlake is a luxurious, 55+ community set among 67 acres of scenic ponds and green spaces in Southlake, Texas. There are attached homes in The Residences and custom-built cottages in the South Village section of the community. An extraordinary clubhouse anchors the community and offers amenities that rival a five-star resort. As part of the Dallas-Fort Worth Area, residents enjoy a prime location within the region. The impressive lineup of amenities in Watermere at Southlake rival those of a five-star resort and put it in a class of its own. A 35,000 square-foot clubhouse greets homeowners upon their arrival at Watermere at Southlake and houses many of the standout amenities. A state-of-the-art fitness center is a great place for residents to stay in shape as is the indoor lap pool. In addition to traditional fitness facilities, there are also yoga and Pilates studios. A full-service day spa offers massages as well as nail and hair salon services. La Mer Restaurant offers modern cuisine in a refined and elegant setting. River Bend Cafe has lighter fare served in a casual environment, perfect for lunch on-the-go. Stone Ridge Lounge is a full-service bar located in the clubhouse with regular happy hours. Dining and beverages can be paid for with credits assigned to residents as a part of their homeowners' association (HOA) fees as well as cash or credit. A library offers residents a variety of periodicals, books, and newspapers as well as computer and internet access. A billiards and card rooms are natural meeting places for socializing. A variety of multi-purpose rooms are available for business meetings, community gatherings, and special events. Outdoors there are ample opportunities for active recreation. A tennis court allows residents to work on their game. Shuffleboard and horseshoe pits are also available. Anglers will appreciate the stocked lake. Parks, winding walking trails, and several scenic ponds provide a picturesque backdrop for leisurely walks. Construction began in 2007 on the 106 attached and custom homes that make up Watermere at Southlake. The Residences are attached homes ranging in size from 2,127 to 2,661 square feet with two or three bedrooms, two-and-a-half or three bathrooms, and an attached two-car garage. Homes are one or two floors with ten-foot ceilings and first-floor master suites on all models. Kitchens feature custom cabinetry, stainless steel appliances, and granite countertops. As members of the HOA, homeowners will enjoy a maintenance-free lifestyle with exterior maintenance, landscaping, lawn care and common area maintenance all taken care of by the HOA. The South Village is a collection of custom cottages built by four builders. These luxury homes are built on a custom basis to the homebuyer's specifications with current homes ranging in size from 2,500 to 3,600 square feet. Homeowners will pay an HOA fee for community maintenance and have the option to join the clubhouse to access its amenities for an additional fee. Residents of Watermere at Southlake can enjoy the finer things in life at this resort-style 55+ community. A wealth of amenities provide neighbors opportunities to socialize and foster a sense of community. Homeowners can stay healthy and active using the state-of-the-art fitness center and indoor lap pool. Residents can pamper themselves or make an appointment to get their nails done at the day spa. Everything from special evenings out to business lunches, to happy-hour drinks with neighbors and friends are often had at the clubhouse's restaurants and bars. Outdoor recreation is a favorite pastime for residents of Watermere at Southlake. Active adults can improve their tennis games or enjoy a challenging game of horseshoes or shuffleboard with neighbors. Best of all, knowing the HOA handles a wide variety of maintenance tasks, residents know they'll have ample time to pursue the activities they love. Watermere at Southlake is located in Tarrant County, Texas and is part of the Dallas-Fort Worth metropolitan area. Routine shopping trips are easy as there are two shopping centers with Sprout Farmers Market, Hobby Lobby, and several banks and restaurants within one mile of the community. There are three 18-hole golf courses within five miles of the community, making it easy for residents to hit the links. Watermere at Southlake is conveniently located between Dallas and Fort Worth with travel times to both city centers under 40 minutes. Dallas has world-class attractions like the Dallas Museum of Art and Windspear Opera House. The city is also world famous for its food scene, particularly BBQ. Football fans will love that AT&T Stadium, home of the Dallas Cowboys, is a 30-minute drive. Long-distance travel is also easy with DFW International Airport just over ten miles away. 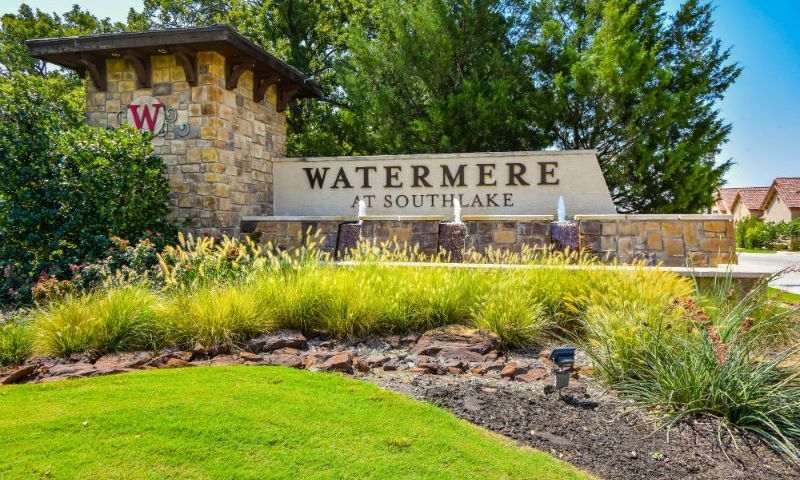 Active adult homebuyers are sure to love the resort-like amenities and prime location of Watermere at Southlake in Northern Texas. There are plenty of activities available in Watermere at Southlake. Here is a sample of some of the clubs, activities and classes offered here. The South Village is a collection of custom single-family homes built by four builders. These luxury homes are built on a custom basis to homebuyers specifications with current homes ranging in size from 2,500 to 3,600 square feet. Homeowners will pay an HOA fee for community maintenance and have the option to join the clubhouse to access its amenities at an additional fee. The Residences are attached homes ranging in size from 2,127 to 2,661 square feet with two or three bedrooms, two-and-a-half or three bathrooms, and an attached two-car garage. Homes are one or two floors with ten-foot ceilings and first-floor master suites on all models. Kitchens feature custom cabinetry, stainless steel appliances, and granite countertops. As a members of the HOA, homeowners will enjoy a maintenance-free lifestyle with exterior maintenance, landscaping, lawn care and common area maintenance all taken care of by the HOA. 55places.com is not affiliated with the developer(s) or homeowners association of Watermere at Southlake. The information you submit is distributed to a 55places.com Partner Agent, who is a licensed real estate agent. The information regarding Watermere at Southlake has not been verified or approved by the developer or homeowners association. Please verify all information prior to purchasing. 55places.com is not responsible for any errors regarding the information displayed on this website.